Travel Output is one of those program which we do not recommend keeping installed because it is not going to do anything beneficial and it might even cause harm to your system. Travel Output is a typical SuperWeb LLC adware program because it promises to enhance browsing experience, but it does not do anything really useful. Users usually notice that this program is just going to display advertisements, so there is no point in keeping it installed or downloading it. The only way to stop the activities of this program is to delete it from the system. Like the majority of adware programs developed by SuperWeb LLC, it can be removed via Control Panel. You will find a full explanation how to do that in this article. Even though Travel Output claims to be beneficial, it is not worth trusting any of its words because it is just going to distribute commercial advertisements. According to the information provided in the End User License Agreement, you might see different types of ads, including video ads, in-text ads, interstitial ads, banners, pop-ups, and audio ads. These ads are annoying and they might ruin your browsing session. On top of that, they might expose you to threats. Of course, not every single advertisement is harmful; however, you will never know whether you click on a trustworthy advertisement or not. As can be seen, it is very easy to cause harm to the system, but we do not think that you want to do that. Therefore, we recommend erasing Travel Output as soon as possible. Make sure that other adware programs cannot enter your system in the future. If you do not know how to do that, you should know that you simply have to acquire a security tool. Travel Output usually comes bundled with other untrustworthy applications. You might have agreed with their installation without knowing that, so it is worth scanning the system with an antimalware scanner. If your scanner detects suspicious software, make sure that you erase it as soon as possible because untrustworthy applications might download other programs on your system and they might act in an undesirable way. As a consequence, you will not be able to use your computer freely. If you do not have time to take care of your PC’s safety yourself, you should leave all the work for an automatic security application. You could try the reliable SpyHunter scanner if you scroll down and click on the download button. 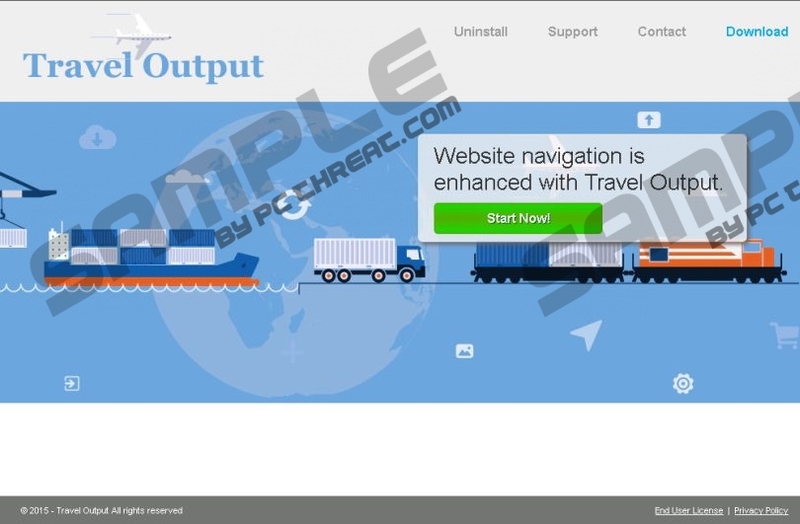 Travel Output is compatible with all the major browsers, including Internet Explorer, Google Chrome, and Mozilla Firefox, so you will still see advertisements if you change your browser. Our security specialists believe that you have to eliminate Travel Output entirely if you do not want to deal with it day after day. In order to help you do that, we have prepared the manual removal instructions. Follow them step by step and you will definitely remove Travel Output very quickly. If you do not like removing software manually, you can use SpyHunter or another tool for this matter. Select the program and click Remove. Right-click on the undesirable software. Tap the Windows key + X and open Control Panel. Find the unwanted program on the list. Select it. Quick & tested solution for Travel Output removal.